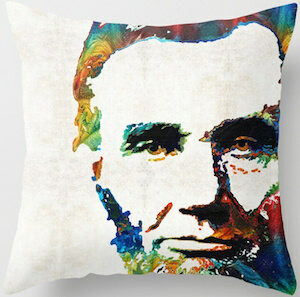 Now there is an Abraham Lincoln throw pillow and that would be a great addition to your interior. The pillow is available in 4 sizes 16, 18, 20, and 24 inches and all are square. You can choose between an indoor or an outdoor version so that you can have the pillow perfect for your needs. The pillow has a light colored background and on top of that, you can find the portrait of President Abraham Lincoln and his portrait has plenty of colors which makes it look really cool and different. So now you can have US president in your home just lounging on your couch or a chair because the president is placed on this pillow.